Under the supervision of the Athletic Director, Our Savior Lutheran School offers a well-rounded athletic program. The primary objective of the program is to provide all students the opportunity to participate in a team sport. Practices are usually held after school, but may be held when free time is available during the school day, such as lunchtime. The student’s teacher in consultation with the student’s parents and coach determines student eligibility for participation in athletics. The Principal, whose determination is final, may review a decision on eligibility. A sports physical is required each year prior to participation in that sport program. These physical examinations are available here at Our Savior Lutheran School close to the beginning of the year for a nominal fee. Download the form below or pick one up in the school office. 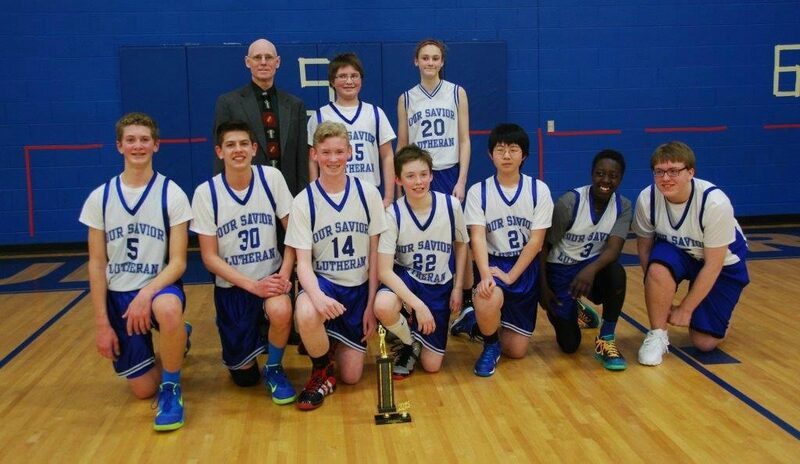 The program of extra curricular athletics at Our Savior Lutheran School is concomitant with the Purpose Statement of Our Savior Lutheran School (See Our Savior Lutheran School Purpose Statement). Extra curricular athletics are a supplementary vehicle for developing the complete and well-rounded Christian citizen of both the Kingdom of God and the nation in which we live. Excellence is the goal of each and every endeavor sponsored by the parents, the school, and the faculty. The athletic program at Our Savior Lutheran School has several goals. These goals include helping students learn discipline, cooperation, sportsmanship, and fundamental skills. Participation in team sports also helps students understand that hard work, sacrifice, and cooperation often are necessary to achieve team goals in a competitive program. Discipline: Participating in team sports is a good avenue for teaching discipline. Students learn discipline in practices and games where everyone on the team has a job they are responsible for doing. Cooperation: Through practices and games, students learn to cooperate and play together as a team. Successful team play requires that students learn to sacrifice “self”’ for the benefit of the team. Students learn that through cooperation and sacrifice the Team becomes successful, whether the game is won or lost. Sportsmanship: Sportsmanship is taught at every practice and every game. Students are taught to work hard and play within the rules. Athletes are taught to graciously accept victory or defeat (according to the scoreboard). Students are always winners when they make their best effort and all are winners in Christ. Athletic Skills: Students learn basic fundamental skills and have the opportunity to use those skills in competition, both within the team at practice and playing teams from other schools. Education: In keeping with the Purpose Statement of Our Savior Lutheran School, academics are a first priority for the student athlete. Therefore, students will not receive preferential or deferential treatment in the classroom, in any way, as a result of their participation or abilities in extracurricular athletic activities.